The Annapurna region is the most versatile trekking region in Nepal. From tallest peaks to deepest gorges to highest lakes, the region has it all. It also houses the country’s windiest, driest, and wettest places. There are more than 50 trekking routes and destinations for all kind of trekkers. However, most of the times, travel agencies have a fix itinerary and follow a specific route to the destination. While there is nothing wrong with it, it is more fun and adventurous to add a little side trip here and there to make your trip more unique, include more experiences, and have more fun. Here, we have listed down 4 side trips that you can add as a detour to your main trek. 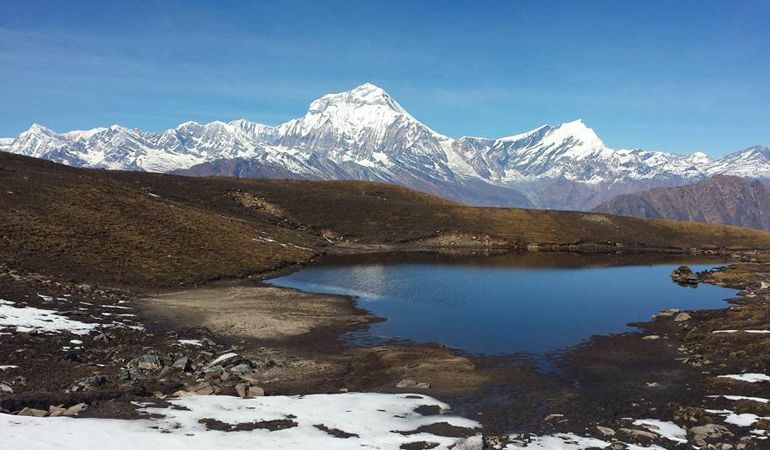 Khopra Ridge trek is already one of the most scenic trekking routes in the Annapurna region. But still you can add more destinations and landmarks to the trek for a further elevated experience. One such beautiful, natural landmark is the Khayer Lake. It is a splendid alpine lake at an elevation of 6,000 meters, perched right below the peaks. However, it isn’t easy to reach the lake. It is a very hard, ambitious but rewarding hike to the lake from Khopra. The lake is 1,000 meters ascent and descent from Khopra! The trek will be about 9-10 hours long, so it is wise to start early at the crack of dawn. Once you reach the destination, the view of the lake and the surrounding peaks will simply blow you. If you are feeling more adventurous, take a tent and camp in the high-altitude summer pasture right before the lake. Annapurna Circuit trek in itself is very interesting as you don’t have to trek down the same route you climbed to get there. But still there is room for more adventures! One such adventure is the Milarepa’s Cave. It is a very worthwhile side trip from the Bragha village in Manang. Also, it is a very famous pilgrimage site in the Manang with a very interesting backstory. To reach the cave from Bragha, you have to trek for about 1 and half hours through the eroded crag trail after crossing a bridge. After the last 45 minutes uphill trek, you will reach a 4,320m high ridge that offers excellent views of the nearby glacier. The ancient ladders that once accessed the cave have been destroyed. However, you can still see the saint’s footprint which have been carved into the cave’s wall. There is one more side trip during the Annapurna Circuit trek that you should not miss. However, it is a two-day-long side trip and only continue forward if you are in good physical health to complete it. This side trip will take you right into the foot of the Dhaulagiri Icefall and offer great views of Dhaulagiri One and Annapurna range. The route begins from just south of Larjung village, a couple of hundred meters past the suspension bridge on southern side of broad GhattaKhola. You will then trek through forests, pass through green pastures, and once again pass through rhododendron and pine forests. From here, the trail continues steeply for about two more hours to reach the icefall. While returning, you will have to return through the same route but can take a few shortcuts here and there. This one isn’t necessarily a side trip, but it is so special that we had to include it in our list. Lo Manthang can be added to your Lower Mustang and Muktinath trek if you want to see the more authentic and well-reserved trek of the Mustang region. You can begin from your journey from Kagbeni. Since it is a side trip, we suggest you to take a jeep to reach your destination. Lo Manthang in ancient kingdom that even had an officially recognized king until few years ago. The walled kingdom is really truly fascinating with its century’s old palaces, monasteries, and perfectly placed homes. There are four main monasteries here like the 15th century’s Thubchen Gompa, and the three-storeyJampa Lhakhang. It is surely going to be a very great experience to see such sophisticated culture and a flourishing economy even in such harsh and isolated terrains.